The sun is shining over St. Louis, and the ice and snow has finally melted away. 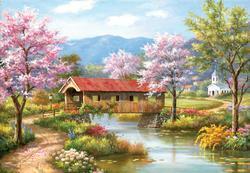 Because after winter there always comes spring, this week's jigsaw puzzle of the day honors that wonderful season with the colorful 300 pieces jigsaw puzzle by SunsOut – Covered Bridge in Spring. We believe that winter has its glow around holidays when you can go skiing or snowboarding and around Christmas and New Year’s Eve. After that, though, it starts to get old and may even start making you feel a bit melancholy: everything seems frozen. We bet you can’t wait to see those trees blossom again and the green grass to cover the ground. And let us not forget about those sweet songs that birds will sing early in the morning or about those shy sunny rays. Oh! And the wonderful trips in the mountains or perhaps to the beach. We all love spring because it is such a balanced season – not too hot, but also not too cold, not too dry but also not too rainy. One of its best parts is that you can leave your iPod home. Why? Well, it would be a shame not to enjoy the birds trill or the bees tingle. If winter persists outside your house and our words have cruelly made you pine for sunshine, perhaps this spring themed jigsaw puzzle of the day can act as a surrogate until those warm spring days knock at your door, too.